Dave's Gourmet is the result of Dave owning and managing a small restaurant called Burrito Madness near the University of Maryland. Late at night a number of Dave's patrons were usually drunk and troublesome. Quickly Dave discovered that if some of these drunks ate super-hot hot sauce, then they either left or became extremely quiet. Since it worked out that the hotter the sauce, the faster drunk patrons left; Dave went on a mission to create the hottest sauce in the Universe. The end result of this mission was Insanity Sauce which Dave took to the National Fiery Foods Show in New Mexico. At the show the sauce made quite an impression and not just because of the straight jacket that Dave wore. In fact, Insanity became the only product ever banned for being too hot. Since that day over 13 years ago: Burrito Madness was sold, Dave set up Dave's Gourmet, Inc., and seventy other products have been added to Dave's Gourmet's offerings. 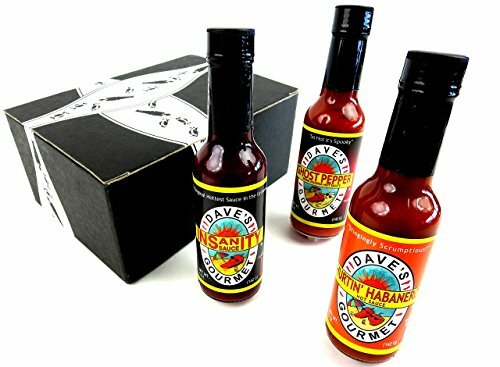 Now get a BlackTie Box for any occasion featuring one 5 oz bottle of Dave's Gourmet Hurtin' Habanero Hot Sauce, one 5 oz bottle of Dave's Gourmet Insanity Hot Sauce, and one 5 oz bottle of Dave's Gourmet Ghost Pepper Naga Jolokia Hot Sauce.